Courtesy of Maratón Acuática Internacional Santa Fe - Coronda, Coronda, Argentina. A unique recognition of open water swimming visionaries and organizers took place at the Bar Plaza Café in Coronda, Argentina last week. 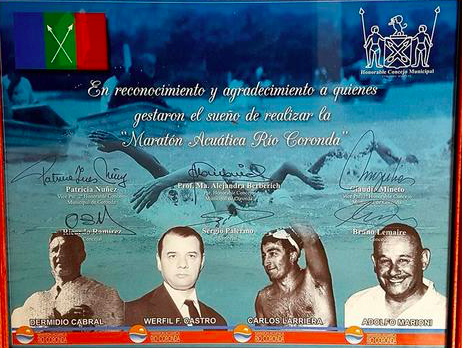 The race planners of the Maratón Fluvial del Litoral Argentino that was first held on November 11th 1960 were honored. The 57 km race later became the Maratón Acuática Internacional Santa Fe - Coronda and is one of the annual events on the FINA Open Water Swimming Grand Prix professional circuit. 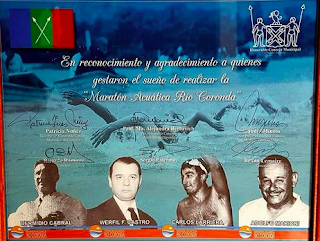 Carlos Larriera, the winner of the first edition of the race and an International Marathon Swimming Hall of Fame Honour Swimmer, as well as the relatives of Werfill Castro, Dermidio Cabral López and Adolfo Marioni - men who helped set in place the plans for the inaugural 57 km river marathon in 1960, were honored by the mayor and Ignacio Páez, the current president of the Asociación Maratón Acuática Río Coronda organizing committee . The 44th edition will be held on February 4th 2018.